Advancements and achievements in dental technology have revolutionized the construction and function of today’s better-than-ever dental implants. Dr. Bowen takes advantage of this technology and can create realistic-looking replacements for your missing teeth. While old-fashioned bridges and dentures make for an appealing aesthetic, they are only achievable on the surface and thus give no support or structure to the missing bone beneath the gums. Greater stability means more security with every bite or conversation, with long-lasting, lovely-looking results right down to the root. 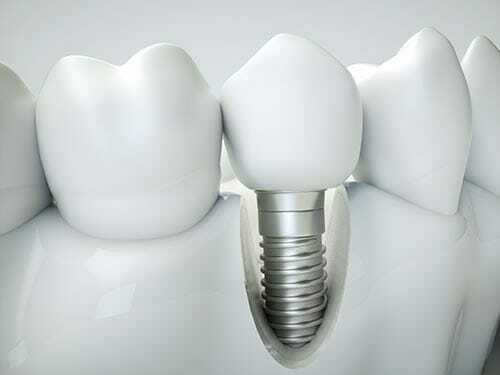 What are dental implants made from and how are they attached? Each implant has three sections – the post, the abutment, and the restoration. Dr. Bowen will refer you to a highly reputable prosthodontist who will work with you to place your post and abutment, and she will provide you with the restoration portion, or the imitation tooth (the part of the implant that is above the gum line). Biocompatible titanium is used to create the post and abutment. The root of your to-be-replaced tooth will be cleared away to make room for the post which is inserted into the jaw. This provides a secure setting for the restoration which is connected via abutment to the post. Nature takes over during the next phase of the process as your natural bone and titanium post fuse together to create a strong, and strikingly similar to natural, foundation. While this is going on, Dr. Bowen will design your crown and ensure placement is comfortable and functional. One of the most beneficial attributes of dental implants is their strength, stability, and similarity to a natural tooth. It is still important, however, to maintain consistent and diligent hygiene habits, especially in order to extend the life of the implant. Despite this, occasionally problems could arise like the restoration portion of the implant (the crown) could become damaged. That is why scheduled check-ups with Dr. Bowen twice per year is recommended. Dr. Bowen will examine your implant and provide you with the care and treatment necessary to return your implant to its healthy function.